I think it’s safe to say that we all wish we could’ve started sooner. Imagine where your business could be if you started it a year earlier. Imagine how much more experience you would have if you started a year earlier. Now imagine how much more you would know if you were introduced to entrepreneurship when you were seven. You can’t go back in time, but you can give that opportunity to your child or another kid you know. 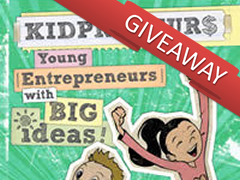 This is the reasoning behind Adam and Matthew Toren’s latest book, Kidpreneurs: Young Entrepreneurs with Big Ideas. These brothers have eclectic entrepreneurial careers and they want to share their passion for entrepreneurship with kids who have never heard that funny word. Yes, I’m giving away a free (signed!) copy of this book. The Toren brothers graciously gave me an extra copy to give away. Find out how you can win it at the end of the review. I’m sad to say that the contest is over. You can see the winning comment below. Thanks, Tom! I have two other giveaways planned for this site. So finishing reading this article and stay tuned for the contests yet to come. Kidpreneurs’ mission is to empower and educate the future generation of entrepreneurs. This 64-page book is written for ages 7-13 and does a great job of laying down the basics of business. Good point, most people don’t become what they wanted to be when they were a kid due to a lack of focus and planning. An interactive experience with numerous activities and quizzes at the end of each chapter. Interesting facts like: pink lemonade was invented by a 15-year-old circus employee. Specific examples of businesses kids could start and what they need to do to start them. A section devoted to how young entrepreneurs can safely use the Internet to build their businesses. Entrepreneurs are the first to admit that nothing is perfect. Here are a few things that I think could’ve been improved. Exercises could distract from the content. At only 64 pages, it’s the bare bones business concepts. A lot of focus on starting and not as much on building a business. By the way, all this so-called “bad stuff” can be explained by reiterating that the intention of this book is to interactively teach basic business concepts to young kids. Nonetheless, those were my observations. 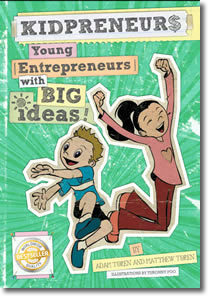 If you have a kid who you want to teach entrepreneurship to for the first time, this book is a must-have. If you want to learn how to expand an existing young business, then this is the wrong book. You can get it on Amazon for a few bucks cheaper, but you shouldn’t. Here’s why: The Toren brothers have pledged that for every book sold, they’ll give away a book to a child who can’t afford it. So sacrifice your morning coffee, buy a book directly from them and another kid will get a free copy. So… How Can I Win the Signed Copy? It’s very simple. Answer these two questions in the comments area below. I’ll contact the owner of the best response and I’ll ship it the next day. Why do you want this book? What will you do with the free copy? This contest will end on Friday, January 15th at noon MST. P.S. If you’re a JuniorBiz Email Subscriber and you win, I’ll bookmark my favorite page with a Nolan Ryan baseball card! Good luck.